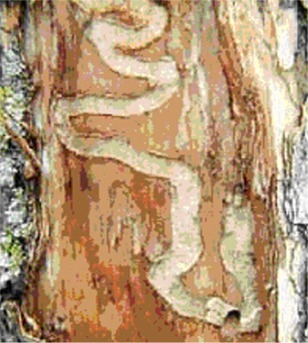 The emerald ash borer has killed millions of ash trees in the states of Ohio, Michigan, Illinois and Indiana! This insect has been identified in Porter and St. Joseph counties in northwest Indiana and Kane county in northeast Illinois. The professionals at Matt’s have communicated with arborists in Michigan to find out what actions and steps they have found to be successful against this dreaded insect. Why Michigan? Because they have been dealing with this insect for the longest time and have identified successful and unsuccessful methods of treatment. In most cases pre-treatment is the key, if you wait to identify advances signs of borer activity it may be too late to save the tree. 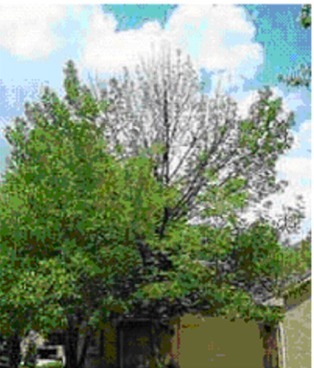 For more information on our treatments to protect the ash trees, you may contact us at 219-838-8900. We gratefully thank and acknowledge the staff at the world famous Morton Arboretum for allowing us to post the following information from their web site. Every tree species has a unique combination of defining characteristics. 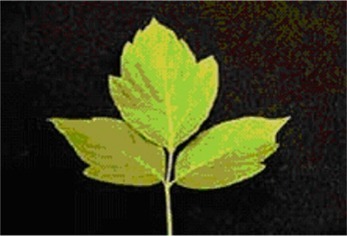 Variations in leaf size, shape, and arrangement can assist in identification. 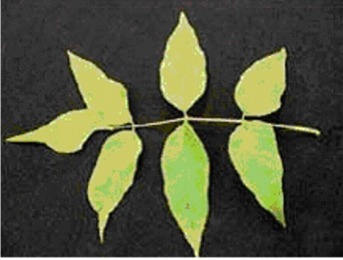 Use the following images comparing ash to other trees in determining if your tree is an ash. 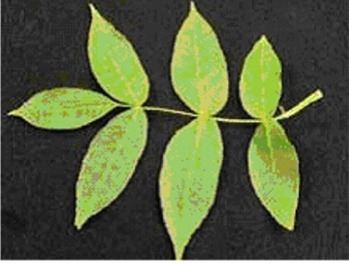 Ash leaves are arranged oppositely meaning leaves and branches are located across from each other. The leaves of many other species are arranged alternately. 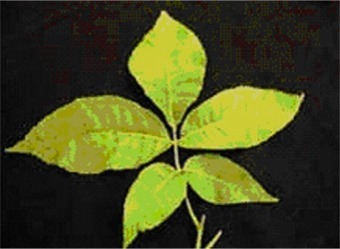 Ash leaves are compound and made up of more than one distinct leaflet. 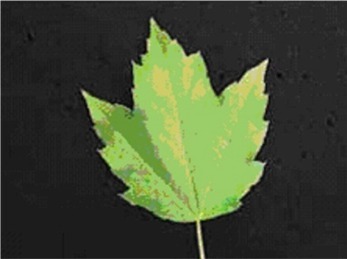 In contrast, simple leaves such as those on most maples are undivided. 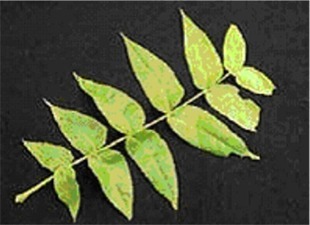 Most ash leaves have 5-9 leaflets with a single terminal leaflet. If there are less than 5 leaflets or more than 9, it is generally not an ash. However, occasionally black ash and blue ash can have up to 11 leaflets. 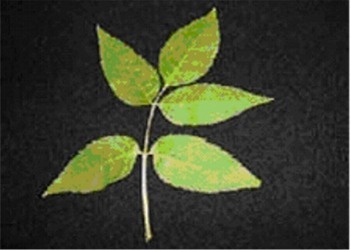 5-9 leaflets on black ash (Fraxinus nigra) leaf with a single terminal leaflet. 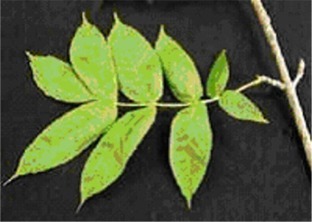 The largest ash leaflets occur near the middle of the leaf. 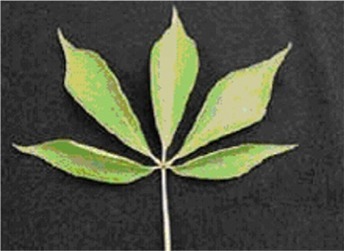 By comparison, the largest hickory leaflets are near the tip of the leaf. Ash leaves are pinnately compound. Leaflets are arranged along either side of a central axis like a feather. 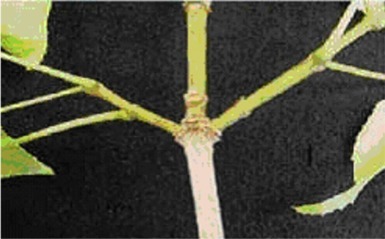 This differentiates ash from palmately compound leaves such as those on buckeyes where leaves originate from a single point. The margins of the ash leaflets are toothed and not lobed as seen on the box elder. Adults are bright metallic green beetles that are approximately 1/3 inch long and 1/16 inch wide. They have flat backs and rounded abdomens. They are present from mid-May through late July. Larvae reach a length of approximately 1 inch and are creamy white, flattened, and segmented. EAB adult beetles emerge from infested trees beginning in mid-May, peaking in late June, and continue emerging until late July. Beetles feed on ash foliage causing irregularly shaped patches along leaf margins and minor feeding damage. Females lay approximately 75 eggs on the bark of branches and trunks from late-May through July with hatch occurring in about one week. 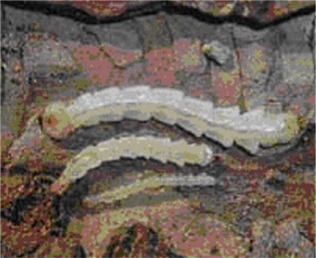 Larvae tunnel into the cambium area between the inner bark and outer ring of wood, feed on phloem and outer sapwood, and produce galleries (tunnels) that disrupt the flow of water and nutrients within the tree. Feeding is completed in autumn and larvae overwinter in shallow chambers excavated in outer sapwood or bark of thick-barked trees. Pupation begins in late April. Maintaining tree health is important. Research suggests that insecticide treatments may be more effective if overall tree health is maintained. Fertilize trees in the fall or spring and provide supplemental irrigation during periods of drought. Trees should receive approximately one inch of water per week during the growing season. Do not move firewood! Use local sources of firewood. 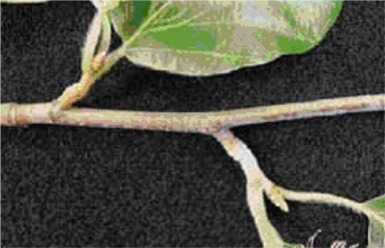 Movement of infested firewood and wood products has repeatedly been found to be the major cause of introduction of EAB and other exotic pests into new geographic areas. The best long-term defense against EAB, and other future invasive insects and diseases, is to plant a diverse range of trees. 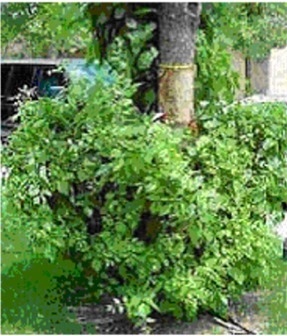 There are a variety of shade trees that can be used in lieu of ash. These include the disease-resistant Accolade® elm, Kentucky coffee tree, gingko, Marmo Freeman's maple, swamp white oak, chinkapin oak, bur oak, and Redmond linden. 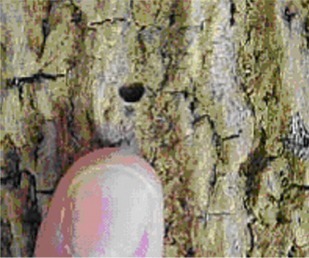 The emerald ash borer was first detected in North American in the Detroit, Michigan area in June 2002 and later that year in Ontario, Canada. Since then EAB has been found in Ohio, Indiana, Maryland, and Virginia. The Maryland and Virginia infestations resulted from Michigan nursery shipments to those states in direct violation of the Michigan quarantine. Continuing survey activities in both states have shown no further detections of this pest. The natural spread of the EAB is about half of a mile or less annually; however, humans can greatly accelerate its spread. 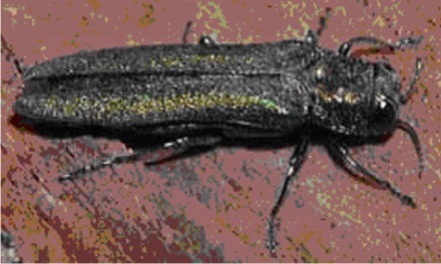 Firewood and log movement have been the primary means by which EAB is spread.EAB is native to Asia and is suspected to have arrived in this county in cargo utilizing wood packing material. In its native range, EAB attacks and kills trees that are weakened by stresses such as drought, disease, and mechanical injury. Unfortunately, in North America, EAB also attacks and kills healthy trees. This invasive pest is so aggressive that virtually all native ash trees are at risk, and trees may die within two to four years after they become infested. Already over 15 million North American ash trees have succumbed to this borer. If EAB is not contained, the devastation to our ash trees may be similar to that of our American elms, which were decimated by Dutch Elm Disease. The potential impact from EAB in Illinois is significant. Ash trees account for six percent of forests state-wide and 20 percent of urban forests in communities in the northeastern part of the state or approximately 130 million ash trees. The Morton Arboretum led the way in advocating for and catalyzing EAB prevention and readiness plans. In 2003, the Arboretum brought together a Readiness Planning Team comprised of over 40 representatives from state, federal, county, and municipal governments, the green industry, and non-profit organizations. The Readiness Plan charged the Arboretum with conducting surveys to detect the presence of EAB using trap trees that were likely infestation targets. For two years, about 200 trees surveyed yielded no EAB presence. The Arboretum convened a multi-state firewood forum in May, 2006 to network regional federal and state officials concerned about the spread of EAB. For the last two years we collaborated with Michigan State University to test several Asian ash tree species for susceptibility to EAB. It is our goal to breed an ash resistant to EAB.